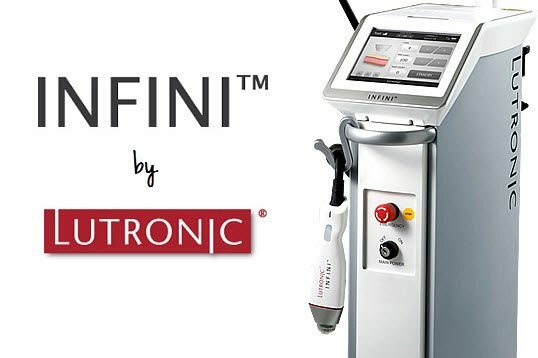 INFINI-microneedling procedures are performed at The Institute and utilizes RF energy to stimulate the growth of new collagen and elastin fibers. INFINI uses gold-plated microneedles to deliver RF energy directly to the dermis resulting in firmer, thicker, and more rejuvenated skin to improve skin health. This unique and innovative technology protects the top layer of the skin (epidermis) by using silicone coated needles, which allows only a controlled amount of energy to be transferred into the dermis. This treatment works on all skin types, even tanned skin. When the energy is delivered, it stimulates the natural growth of collagen and elastin fibers. You will feel the sensation of microneedle pricks. Topical anesthetic cream and air cooling are used to optimize patient comfort. The INFINI-microneedling procedure takes about 10 minutes to perform. There may be an initial redness and swelling. In a few patients, there may be persistent swelling that will subside after about 24 hours. There are no concerns with the sun following your treatment. If you are concerned about downtime, The Institute offers other radio frequency skin tightening treatments with no downtime. These RF treatments include Exilis Ultra, Venus Freeze, and Pelleve. Usually, within the first week, your skin becomes firmer and thicker. This sensation continues for about 6 months due to collagen and elastin fiber production. Individual results may vary depending on a number of factors. The effects can last for up to three years following your treatment. Each treatment will provide improvement. Setting up a consultation with Dr. DeBias will help determine a treatment plan that will meet your goals and expectations. Each treatment regimen is customized for individual patients.